I can go out of the house without any blush, foundation, mascara and concealer but never without a lip liner and defined brows. I developed my fondness for eyebrow products two or three years ago. I am envious of women with thick brows because their brows can be shaped into well defined arch just by grooming. My brows are sparse and uncontrollable. Achieving that defined brows are primarily out of my own effort with a lot of help from brow products and a spoolie. It is my first time to use a liquid brow liner. Honestly, I was really skeptical that this will work on me. This revolutionary liquid eyebrow liner now comes with a powder tip on the other end!You can simultaneously shade and tint long lasting eyebrows with its smudgeproof and water resistant polymers. This eyebrow powder is made of just the right amount of translucence such that the color is deep enough to conceal the sparse areas your eyebrows but not too dark that it gives an unforgiving tone. If you want a darker tone, just go over the same area twice of more. Suitable for everyone, from beginners to professionals. Use the powder tip to shape and draw the inner eyebrows naturally and the brush tip to define the outer eyebrows. This is the liquid part. When I first swatched the liquid liner, I was not really impressed with the color pay off. In the back of my mind, I was expecting more pigmentation like that of an eyeliner. I honestly thought that the intense color pay off will make this product work but when I applied it on my brows, the opacity of the liner was actually perfect! I can go from the most natural look to my much coveted well defined brows. The liquid part itself is very useful because I can use it alone. The soft pointed brush makes application very easy. With light strokes, I can create fuller brows and a clean brow tail with out using q-tips or concealer to clean the edges. Forgive the dirty product picture. When I got this product, I can't stop using it day after day after day. I was too excited to try K Palette Products that I forgot to take product shots before using them. Contrary to the liquid part, this powder part is very pigmented. This comes in a very distinct powdered form. It does not give any fall outs when applied and it adheres well to my brows. I glides on like a cream. No. 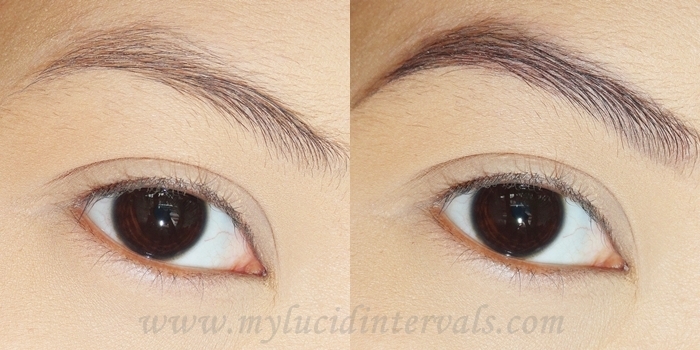 1 (Chocolate Brown) looks perfect on my brow. No.2 (Honey Brown) looks a bit lighter for my black brows. If I want defined brows, I use shade No.1. On days when I want to have that no makeup makeup look, No.2 creates a very natural hint of color on my brows. Also, I use No. 2 powder for contouring the bridge of my nose. K-Palette Lasting 2Way Eyebrow is really a good product. It costs 1050 pesos and this is available in Beauty Bar Branches. Some may find the price too steep for a brow product. I have been using it for more than three months now everyday and I still have a lot of product. This product is really long lasting. It can last almost 5-6 hours on me without retouching (Remember I have normal to dry skin, thus, the longevity of the product may vary depending on one's skin type). I can attest to the fact that this is waterproof because I use it every time I have a court hearing. It can withstand the rain and my sweat (because I usually commute to work). The color selection is perfect for Filipina skin. I reached for Chocolate Brown more than the shade Honey Brown. As I have said earlier, I could use both shades and achieve various effects with them. It also saves me a lot of time. I do not need to sharpen the product like what I do with brow pencils to create that clean brow tail nor spray mixing medium on my angled brush to intensify the color of the brow powder in order to achieve fuller brows.I really love this product. Will I repurchase? Definitely!!! Can be removed easily even with water and facial wash. No need for makeup removers. Th product can be used for months. I have been using mine for more then three months now for everyday. Very travel friendly. K-Palette Lasting 2Way Eyebrow in No.1 and No.2 have never left my makeup kit from the time I got it. What do you think? My brows look cleaner, defined and posh looking. K-Palette Lasting 2Way Eyebrow will probably be the only thing you need in your makeup kit to define your brows. From the time I got this, I forgot about brow mascaras, powders and pencils. This is currently a HG (holy grail) product for me! ** I got this product from the K-Palette Launch for PR Purposes and review. I love this too! :) especially their eyeliner :D can't wait to try their kuma concealer! This is a nice review! Now I know,powder first then the liquid. Thanks!